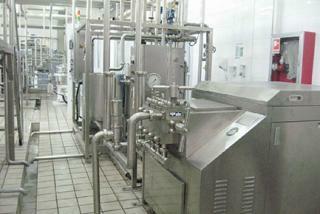 The milk fat content is standardized in a direct standardization system. 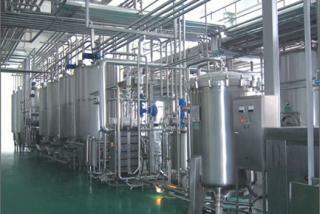 Standardized milk used for producing whole milk powder is not normally homogenized. 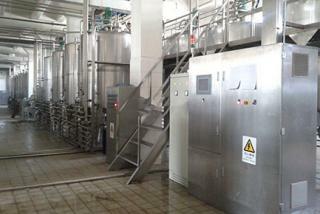 In the production of dried whole milk the heat treatment must be so intense that the lipases will also be inactivated. 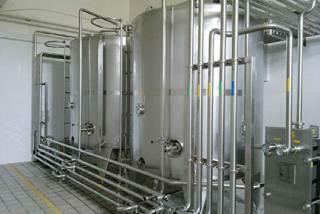 This normally involves high-temperature pasteursation to a negative peroxidase test. 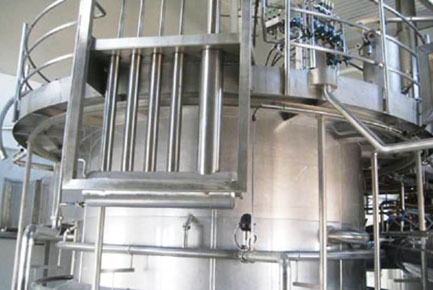 Falling-film evaporators are generally used for concentration, which is carried out in two or more stages to a DS content of 45 – 55%. 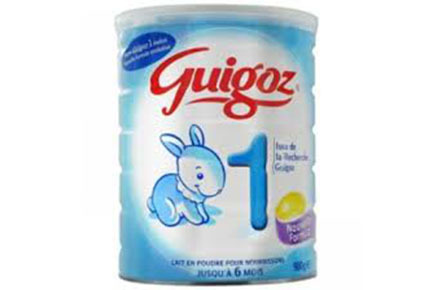 The last traces of moisture are the most difficult to remove, unless high outlet drying temperatures are used to provide a sufficient driving force. 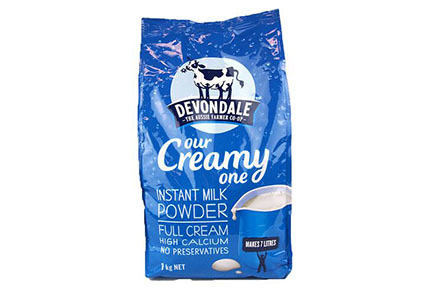 As elevated outlet drying temperatures can have a detrimental effect on powder quality, it is essential to operate at lower outlet temperatures with dairy products. 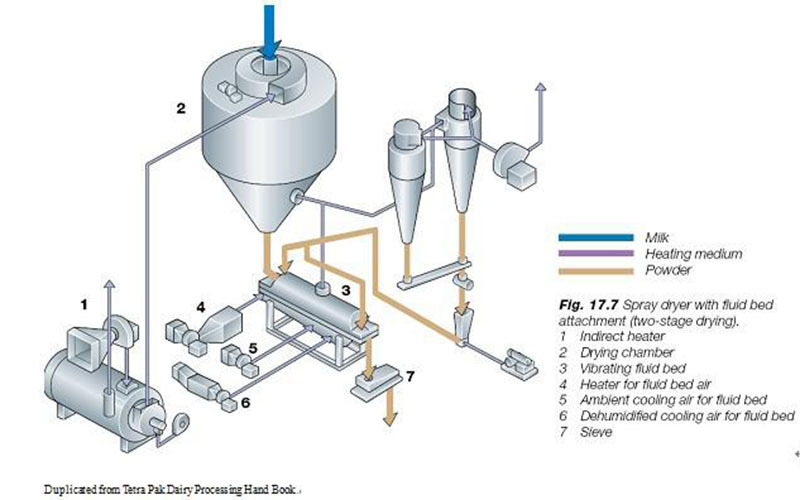 If the moisture content of the resulting powder is still too high, an after-drying stage is incorporated after the spray dryer in a two-stage process as illustrated in figure.Two-stage drying methods for producing powdered milk product combine spray drying as the first stage and fluid bed drying as the second stage. 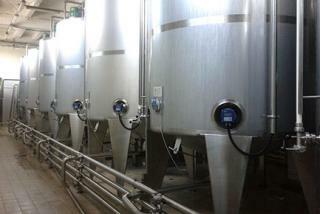 The moisture content of the powder leaving the dryer chamber is 2 – 3% higher than the final moisture content. 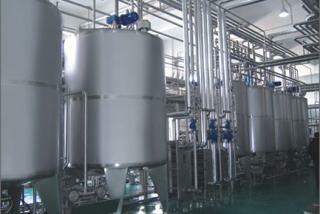 The function of the fluid bed dryer is to remove excess moisture and finally to cool the powder down. 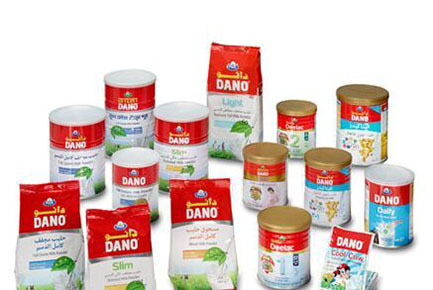 The powder is packed in cans, paper bags, laminated bags or plastic bags, depending on the quality and the requirements of the consumers. 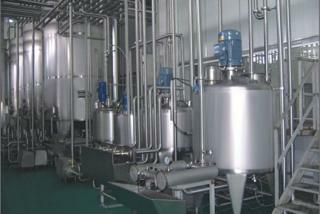 Milk powder production line requires the drying of liquid milk into a powder in which aromas, flavours and colouring as well as many important components such as protein, fat, carbohydrate, vitamins, minerals etc. are retained. 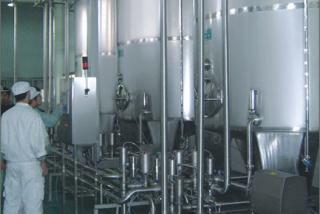 Additional challenges is a uniform moisture content, particle structure and particle size distribution, solubility, dispersability and wettability.